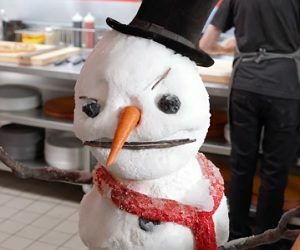 Pizza Hut has released a series of new ads, promoting the Triple Treat Box, a “holiday feast worth melting for”, consisting of two medium 1-topping pizzas, bread-sticks, and the Ultimate Hershey’s Chocolate Chip Cookie for just $19.99. One of the protagonists showcasing the amazing offer is a Hut lover snowman who sings a holiday song about the Triple Treat Box. “Two pizzas and sticks. Throw a cookie in the mix. Every year I need my Triple Treat fix. So much food….”, sings the snowman. Suddenly, he stops and asks a Pizza Hut employee near him: “Wait, is that a hot oven?”. “Guys, I’m snow. Like the melty kind! I didn’t even get to sing about how every Triple Treat Box is a chance to win a Xbox One S”, says the singing snowman, melting under the table. “Well, at least I’m melting in a Pizza Hut. I do love their pizza”, adds the snowman. The spot ends with the voiceover and the snowman saying the tagline “The Triple Treat Box. Because no one out pizzas the Hut”.